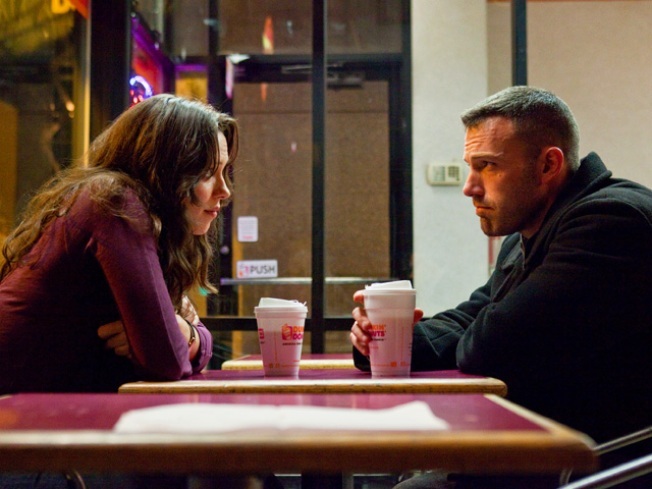 Rebecca Hall, left, and Ben Affleck are shown in a scene from "The Town." The Associated Press reports on Sunday, Sept. 19, 2010, that "The Town" is the talk of the box office, opening with $23.8 million to take the No. 1 spot. Ben Afflecks's Boston bank heist thriller The Town won the top spot at the weekend box office opening at an estimated $23.8 million. With a star-studded cast including Affleck, Mad Men's John Hamm, Oscar-nominated actor Jeremy Renner, and Gossip Girl's Blake Lively, The Town easily beat out teen comedy Easy A and M. Night Shyamalan's Devil, which also opened this weekend, reported the AP. The Town, Affleck's second directorial effort outmatched his $5.5 million debut of first film Gone Baby Gone in 2007, reported The Hollywood Reporter, proving that the co-writer and star is not just a one-hit-wonder filmmaker. Easy A starring smart and charming newcomer Emma Stone earned second place at the fall box office bringing in $18.2 million, and Devil rounded out the top three at $12.6 million. Last week's box office topper Resident Evil: Afterlife held strong to the fourth spot earning $10.1 million.